Jane is a 38yrs old married lady who was living on country side in a small village in Kenya with her 3 children and husband. In 2002 the family was struck with a unfortunate setback, when they discovered that Jane who developed a swelling in front of her neck was diagnosed to be thyroid cancer. The surgery performed at the local hospital found the tumor stuck to the air pipe- trachea and hence was not easily removed. 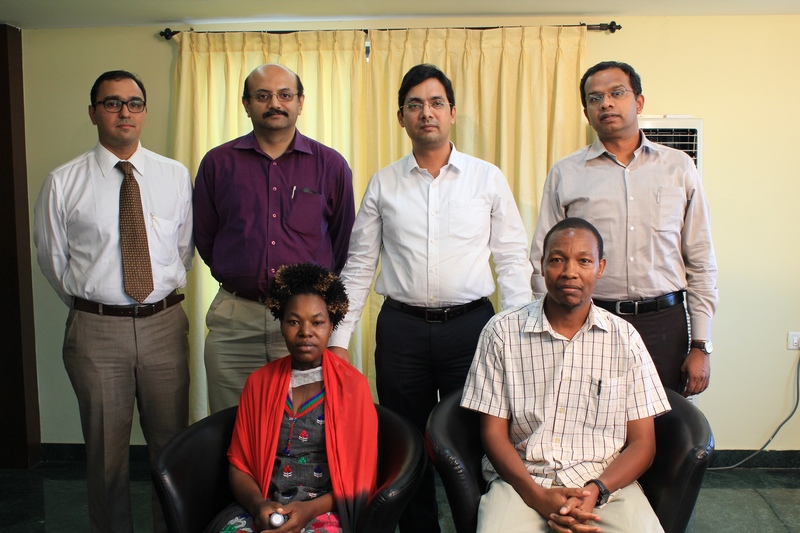 They subsequently treated her with radio iodine therapy and with external radiotherapy to attempt cure. However, despite best attempts from the doctors team, tumour continue to grow and spread. By now the tumor has come to involve the voice box, food pipe, extending lower down into the chest and also spread to lungs. The tumour had also entered the air pipe nearly blocking half of her airway. With the tumour growing rapidly the time was ticking for the family to intervene aptly to reduce her life and also establish an alternate pathway for her breathing. That is when she sought an opinion from Head neck surgical oncology team at BGS Global Hospital and Global oncology institute. 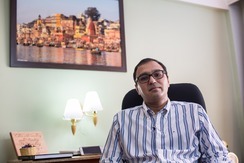 Dr.Vishal Rao, Senior consultant surgical oncology Head neck said that at the time we examined her, the tumour had extended way below into chest in close proximity to the great vessels adjacent to heart. There was no space to do a tracheostomy (hole in throat to access airway). This was a cause of serious concern. Jane was also not in her best of mind set. She was having persistent pain, depression and heaviness with difficulty in spontaneous breathing. A Multi disciplinary team involving head neck surgical oncology- Dr.Rao, Gastro intestinal surgical team - Dr.Srikanth, thoracic surgeon - Dr. Manoj initially discussed this approach and surgical plan. The anaesthesia technique also needed to be planned well in detail said Dr.Rao owing to complicated airway. We initially asked Members of Lary Club to come over and counsel Jane. This gave her motivation, and courage the understand the planned surgical procedure and accept that she had to loose her voice box and speak through a electric machine. She underwent a total thyroidecotmy with total laryngo- tracheo- pharyngo oesophagectomy with gastric pull up and neck dissection combined with thoracotomy. The surgery went on for 15 hrs during the course of which we removed her tumour completely from neck and chest with removal of voice box, food pipe and clearing it safely from the chest region where it was adherent to great vessels. The GI team then reconstructed the food pipe by bringing and connecting her stomach to her tongue. Following this major surgery it was a deep satisfaction to see Jane recover quickly and back on her feet in 2 days. This shows her level of motivation and positive approach she adapted . Her Smile was best gift our Hospital team got for the efforts we put. God was on her side said Dr.Rao. She also underwent radio iodine therapy which has effectively treated her lung lesions. Jane is now back to her to her country and spend quality time with her family and children who eagerly await her arrival.